As IT professionals know, endpoint security needs are evolving: new vulnerabilities are disclosed every day, new malware creation is exploding, and traditional AV signatures cannot keep up. You know that patch management and AV are necessary - but not sufficient - layers of endpoint defense. Intelligent application whitelisting is an important addition to your risk mitigation strategy, and taking prudent measures to establish a best practices approach can help reduce costs and risks in the long term. 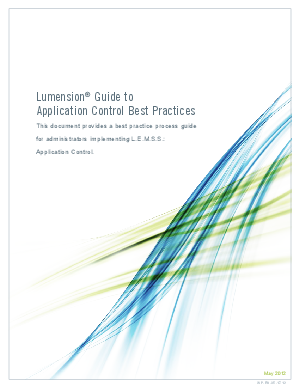 Read this whitepaper to understand the best practice workflow to application whitelisting, and can act as a guide when implementing Lumension® Endpoint Management and Security Suite: Application Control.